The group of lads who kick started their career by busking in the streets of York until rounding up an incredible £5k to pay for their album “Alive”, are bringing something special to the music industry. 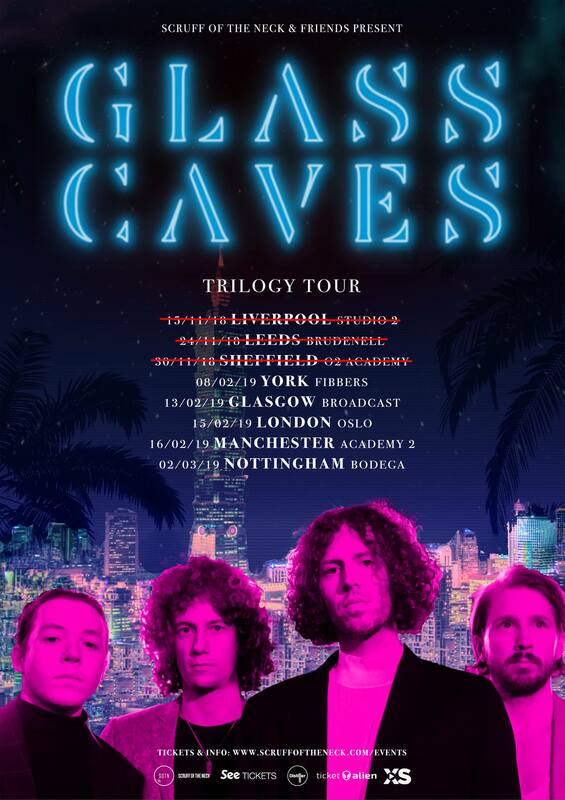 Expect to hear the name “Glass Caves” knocking around for a very long time. No ‘one hit wonders’ here, check out their Album and you’ll see. They’re playing at the Manchester Academy on the 16th February and you’re not going to want to miss it. Expect fiery vocals, clear-cut guitar riffs and exploding drums. We’re definitely not going to miss this one! See you there. After reading up about the 4-piece alternative band, we decided that we wanted to get to know them a bit more. We met at school, started a band called The Cellars, wrote some tracks that people were digging, changed the name and started selling out shows. You kicked off your career by busking in the streets around the UK, what was the biggest challenge you faced? Any advice to give to someone going through the same thing? The biggest challenges with busking are getting used to people not giving a damn, having all your electricals damaged in the rain and attracting all the weirdest people in the city centre who want to be your mate. Advice is to play as if you’re the most confident person in the world – people start taking notice. What was your first sign of success? The first sign of success was getting the Radio 1 BBC Intro track of the week! Then we knew we could write some good tunes… Then we followed on and did a live session for Dermot O’Leary on BBC Radio 2!! Growing up we loved Kings of Leon, The Strokes, Arctic Monkeys, White Lies etc. they all definitely played a big part! Guilty listening is different for all of us, we have some SOAD, some Taylor Swift, some Beebs we like a lot of different music – can cause a lot of tour van scuffs. Our advice would be to keep writing songs until people start connecting with one of them, then write another 5 of them and believe in yourself. What’s the next big thing for you guys?